Anthocyanins are plant pigments that give fruits, leaves, flowers, stems and roots their rich and deep red, purple and blue color. About 560 different anthocyanins have been identified as of 2006. Food sources: the best sources are most berries - blueberry, cranberry, tart and sweet cherry, bilberry, red raspberry, black raspberry, blackberry, black currant, red currant, mulberry, elderberry, chokeberry, acai berry; also, red and purple grapes, eggplant skins, red cabbage, blood orange, red and purple olives. Out of all berries chokeberries (aronia) appear to have the highest concentrations of anthocyanins - 1,480 mg/100 g of fresh weight. Other high-content sources are black raspberry (589 mg/100g), blueberry (558 mg/100g), cherry (350-400 mg/100g), red raspberry (365 mg/100g), acai berry (320 mg/100g). But gooseberry, which is only greenish-yellowish in color when ripe, has almost undetectable amounts of anthocyanins - 0.07mg/100g of fresh weight. In plants anthocyanins acts as a "sunscreen" protecting plant cells from light damage by absorbing blue-green and UV light, thus inhibiting oxidative stress. Anthocyanins have exerted strong antioxidants properties in test tube trials and are the topic of ongoing scientific research for their potential application in the prevention and treatment of a number of diseases: cancer, diabetes, neurological disorders, inflammation, and arthritis and gout pain. Cancer research on anthocyanins has demonstrated some promising results. In particular, black raspberry preparations have been shown to inhibit chemically induced esophageal cancer in rats by 30-60% and colon cancer by up to 80%. Human trials for these two cancers with black raspberry preparations began in 2007 and are underway. Toxicity trial showed that the concentrate is well-tolerated in humans at the administered dose of 45 grams of freeze-dried black berries. However, the absorption of anthocyanins was less than 1% of the administered dose. Also, it has been demonstrated that concentrations of anthocyanins are rather low in fresh berries to provide any noticeable protective benefits, and concentrations of 9-10 fold by the freeze-drying method are required. Further research is needed to determine if anthocyanins alone or their activity together with other phenolic compounds play a role in inhibition of cancer. Preliminary results of this clinical trial can be accessed at the link below. 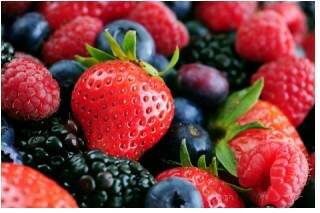 Cancer Prevention with Freeze-dried Berries and Berry Components. Results from in vitro studies using a variety of tumor models show that polyphenolic extracts from cranberries inhibit the growth and proliferation of breast, colon, prostate, lung, and other tumors. But the authors stress that the unique combination of phytochemicals in cranberries may contribute to these effects, not only anthocyanins. Tart (sour) cherry anthocyanins have been found to help lower blood sugar levels in diabetic mice - pancreatic cells responsible for the production of insulin exposed to cherry anthocyanins were associated with a 50% increase in insulin production. The mechanisms of action by which these anthocyanins boost insulin production are still unknown though. Researchers caution against consumption of maraschino cherries, the bright red, candied version that decorates ice cream, deserts and cocktails. Many of the beneficial cherry pigments that were present in the fresh fruit have been removed during processing, replaced with red food dye, and extra sugar has been added, thus stripping the cherry of all the compounds beneficial to health. Anthocyanins in both sweet and sour cherries have been found to inhibit COX-1 and COX-2 enzymes involved in the creation of pain sensations in the body, thus acting as pain relievers with possible application in arthritis and gout pain. These anthocyanins have also exerted anti-inflammatory properties in some studies which may make them useful in fighting arthritis. According to another study published in 2008, rats that were fed whole tart cherry powder mixed into a high fat diet did not gain as much weight or build up as much body fat as rat that did not receive cherry powder. And their blood showed much lower levels of molecules that indicate the kind of inflammation that has been linked to heart disease and diabetes. In addition, they had significantly lower blood levels of cholesterol and triglycerides than the other rats. Researchers do not know yet if the same effects can be achieved in humans. They indicated that in order to reach the same consumption amount as was fed to rats a person would need to eat one and a half cups of fresh cherries a day. Research into berry anthocyanins is very promising, and consumption of fresh berries as part of a well balanced diet is highly recommended. Since tart cherries are harvested only in July and are a highly perishable product - after picking they last for no more than 3 days - you never see them on the shelves of regular grocery stores. But if you would like to add tart cherries to your diet, you have several other choices: these delicious berries are usually available as dried cherries, frozen cherries, canned cherries and cherry juice concentrate. Our favorite is cherry juice concentrate: 1 ounce serving (2 tablespoons) contains all the goodness from about 100 cherries (!). 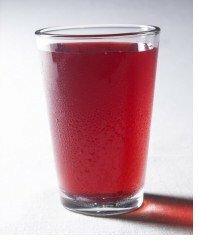 It can be used as is or reconstituted in 6-8 ounces of water and taken as an excellent source of antioxidants, to help ease pain, or right before bedtime as a natural sleep aid - tart cherries are the only food source of melatonin in such high concentrations that it is able to positively affect health. 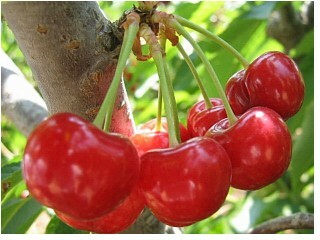 Read more about the benefits of tart cherries. What other foods have melatonin in them?